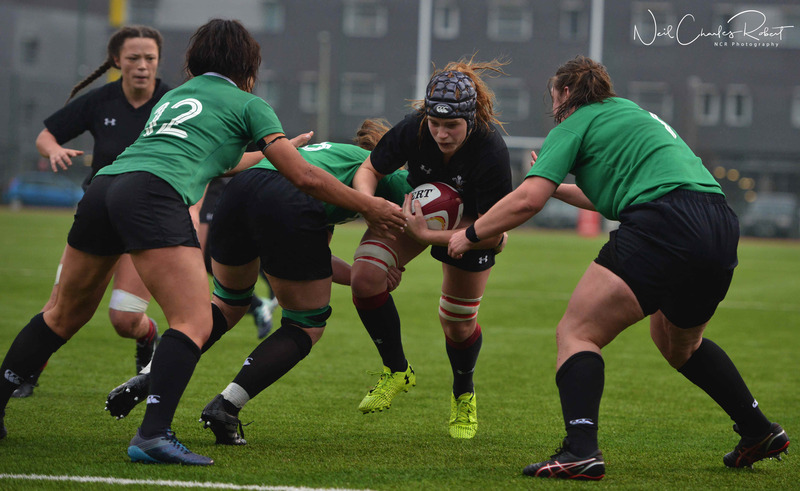 “Winning my first cap in both sevens and 15s was pretty memorable, to be honest,” says Hannah Tyrell, an international rugby player with the women’s Irish rugby team. “Finding out, the day I was picked for a home world cup was a massive thing for me, a real achievement that I’d been building on for a couple of years. The tournament didn’t go the way we wanted to but the feeling when I did get selected was phenomenal. Its hard to pick between one of them, but one of them”. Hannah has had something of a meteoric rise through the ranks. Hannah started playing rugby sevens in October 2013, and was brought into the setup with Ireland around March 2014, and made her debut in May of that year. It’s not like she had no background in sport: quite the opposite. Hannah played football with the Dublin county team, soccer, basketball and even did cross country running too when she was younger. “I tried nearly everything,” she says, laughing. Although she’s contracted with the national sevens team, she often switches codes and plays with the 15’s side, most recently appearing three times during the six nations and not only scoring tries but kicking penalties as well. Her time playing football and running cross country has stood her well in both rugby league and union. Her combination of skills means she is keen on the attack and hard to catch once she’s past defenders. The growth in the women’s game has been huge over the last few years, especially since RTE have been consistently airing all of the women’s games on television and radio over the last number of years. Yet, women’s sport still remains a minority: about 2,000 women play club rugby in Ireland in 2016, but the IRFU were hoping to increase that figure by 50% in 2017. Does Hannah think the media have a responsibility to cover women’s and minority sports, or should they be left grow organically? 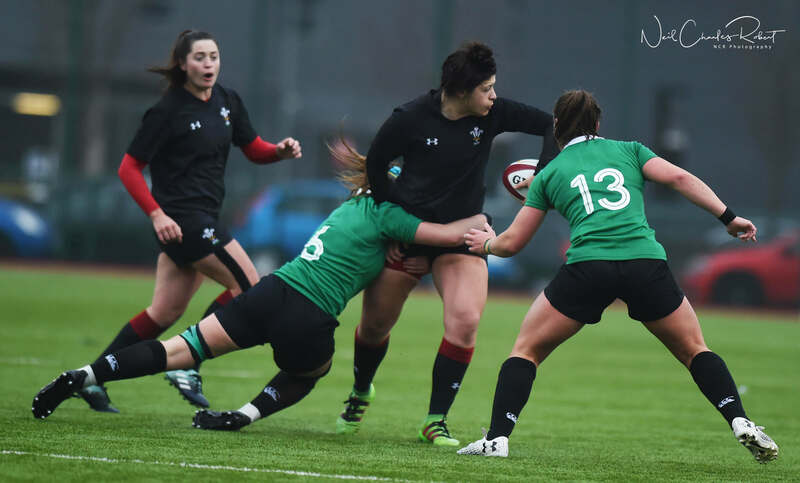 Members of the Welsh women’s team break through a tackle in a game against the Irish women’s team. Photo credit: Neil Charles Robert. For all the growth in the sport, the IRFU haven’t covered themselves in glory regarding the women’s game. Following the less than optimal performance in the Rugby World Cup in 2017, they advertised for a new head coach, as Tom Tierney’s contract was up. Tom Tierney had made history by being the first full-time coach to be appointed to the women’s team, and at the same time, the IRFU appointed full-time strength and conditioning coaches for the first time. However, the new head coach position was advertised as part-time. The IRFU defended themselves, saying that Tierney’s position was as a shared resource between the 7’s and the 15’s team, but it definitely left a bad taste in some people’s mouth. Did this affect morale and the mood at all in camp? “I can see where people were getting really frustrated with the way it was advertised and the way it was positioned, that it looked like we were taking a step backwards. They just didn’t communicate that very well and it led to a blow-up and media storm and like for myself at times it was very frustrating. A little bit of communication would have went a long way there and saved them an awful lot of trouble. Taking away from my position, looking from the outside in, it did look quite bad, especially after having a poor world cup, that we went backwards a little bit”. The Swedish Fellowship of Reconciliation, an interview with Patricia Lozano, a peace observer. Bronwyn Molony is a student journalist in Griffith College. Bronwyn has a BA in Music Production and is currently working towards a Masters in Journalism and Media Communications. Rugby: Who will succeed Brian O Driscoll at 13 for Ireland?